Baybáyin is NOT an Alphabet. To avoid embarrassing typographical errors, it is really important to learn how to actually read & write Baybayin Script and know the rules of both Abugida & Filipino orthography (spelling and pronunciation) first. These are thorough tutorials by Paul Morrow on how to write using Baybayin script in the original Filipino and modified Spanish methods. These tutorials are the most reliable and concise instructions online. This is the most frequently asked question regarding the script. This page offers strategies for writing difficult non-Filipino words and names in the baybayin script. "Easy Keyboard Access" this is one of the main benefit of Baybayin FONTS; for convenient usage and typing in word processing & graphic editing softwares. Multiple instances of vowel characters and little to no kudlit marks are the usual tell-tale giveaway. "Easy Keyboard Access" does NOT mean "go ahead and type anything and it will be correct". When using either Paul Morrow Fonts or Nordenx Fonts, the capital letter keys (shift+) A, E, I, O, and U will type Vowel Characters (ᜀ, ᜁ, ᜂ). Each of these characters represent a stand-alone vowel SYLLABLE not just an alphabet or letter with a vowel sound. 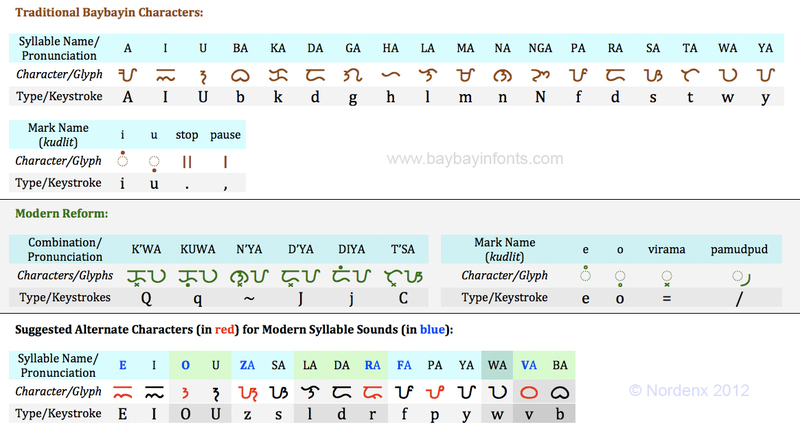 Each Baybayin Consonant Characters are also singular SYLLABLES that already has a default /a/ vowel sound. A kudlit mark is added to the character to change the /a/ vowel sound to the other vowel sounds /e/, /i/, /o/, or /u/. This is done by typing the lower-case vowel letter keys (e, i, o, or u) after the consonant character. The kudlit mark (dot, slash, caret, or chevron, etc.) should appear above or below the character after you typed the lower-case vowel. A virama mark (x-kudlit or pamudpud) is added to the character to cancel the inherent or default /a/ vowel sound to create a vowel-less consonant character (dead-consonant). The x-kudlit (a modern replacement for the krus-kudlit introduced in the Doctrina Christiana) is recommended for leading or stand-alone dead-consonants, the pamudpud (a virama used by the Mangyan tribes of Mindoro) for trailing dead-consonants. When you know the rules and know how to read & write in Baybayin script, install one or a few Baybayin fonts in your computer then familiarize yourself where and in which keyboard key is each character or glyph assigned to (you can use this tool - click here). Typing Baybayin in wordprocessing or graphic editing softwares should be straightforward by then. Using Baybayin characters online like typing your status on facebook or in a chat client is a different story. Online, Baybayin fonts requires using the Unicode range which is normally not easily accessed by your regular keyboard. The Unicode range can only be accessed using a specialized program like an online tool/application of by changing your keyboard's settings. * may differ or not be available (yet) in some fonts. There are several modes of writing Baybayin, don't mix them together in one composition. Don't confuse your readers. Ideally, Babayin should be used primarily for Philippine languages. However, Baybayin has been known to be used by natives to write some Spanish and English (in "Pilipinized" spelling) words. Use borrowed words sparingly and only if there are no available equivalent words for them in any Philippine language or even Spanish. If you have to use the word as it is, you should follow the official rules on how to Pilipinize the spelling & pronunciation of foreign or borrowed words and how to break-it-down into syllables as laid out by the Philippine National Language Commission in the Balarila (Rules of Orthography). If the word is an important scientific or technical term and you do not have a direct and official translation to any Philippine language or Spanish - don't Pilipinize the spelling and don't write it in Baybayin Script, use the Latin Alphabet instead. If the word is a name of person (or organization) - don't Pilipinize the spelling and don't write it in Baybayin Script, use the Latin Alphabet instead - unless that person (or group) made known to you or the public how they write his/her name in Baybayin (or they personally requested you to do so); how one prefers their name spelled & pronounced is a personal issue. -> CLICK HERE <- for more info about using Baybayin Script in Acronyms & Initialism.